Your Raven crew, and lots of other cruisers, have gone high tech. In the olden days of cruising, boats were wooden, navigation was by the stars, and comforts were minimal. These days, although some pine for the old days, everyone uses the US military's Global Positioning System (GPS) with its instantaneous latitude and longitude, and most have former luxuries like refrigeration and watermakers. These technologies have become cheaper and more accessible, so lots more take advantage. Anyway, if you know Jan, you also knew we'd have a ton of electronic gear aboard! First of all, websites like ours are far from rare. 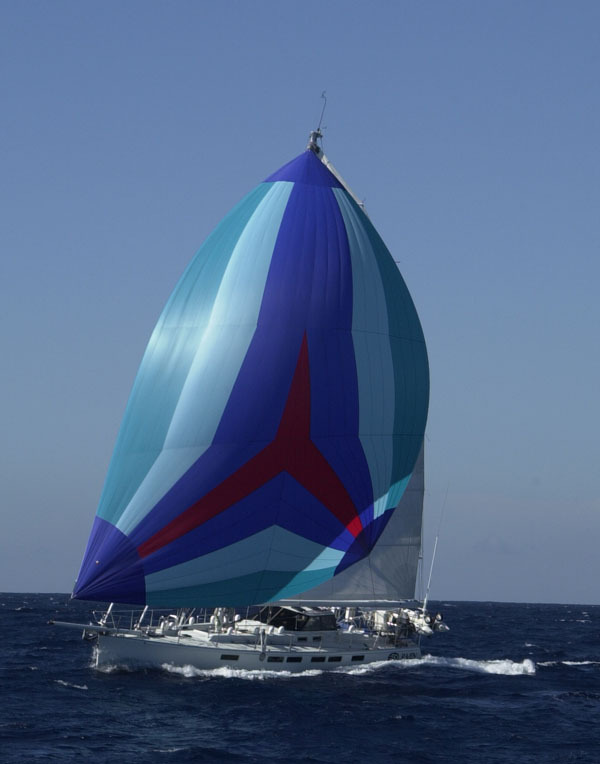 Many cruising sailors all over the world, and of many nationalities, use this flexible method to keep in touch with family and friends. Some of them are professionally created and maintained, but most are pretty low tech, handmade jobs like ours. If you want to see how others do it, this website has a long list of them: Cruise News: Ships at Sea. 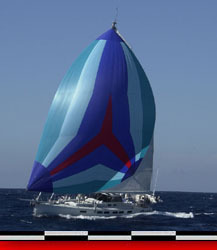 And the Dashews' website (www.setsail.com) has some of the best logs, photos, and reports from cruisers, as well as plenty of material about cruising in general. Tacoma graphics artist friend Jerry Petteys gets full credit for the overall look of our website. We have gradually added complexity to Jerry's original, clean design, so if it looks lopsided or crowded that's our fault, not his! 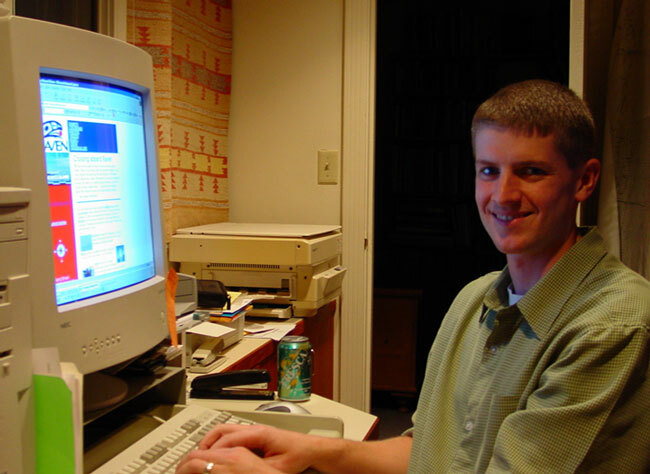 Jay, our webmaster, is a talented computer engineer from a large company in the Pacific Northwest and without him we couldn't maintain the website or send out our email notices of updates. He does a great job of assembling all the text and photos we email him, using Microsoft FrontPage (plus his own HTML code) to create new web pages out of our material. He uses WS_FTP Pro to upload it to our web host, and then he sends emails to our friends and family announcing the updates. We take lots of digital photos and store them on our Dell laptop computer. Every few weeks, Signe or Jan will sit down and write about recent adventures, emphasizing the the fact that we're having a great time, of course! Then we'll sort through all the photos to find the ones that best illustrate our story, or give the best impression of cruising or the country we're visiting. When we have a full set of new web page material ready (photos, text, graphics, email text), Jan 'burns' a blank CD-R with the whole package -- usually several megabytes -- and takes it to the nearest internet cafe to email it to Jay. Of course, there's many a slip twixt the CD and the net, especially in third world countries, and it can take hours or even days to get the material emailed properly. Then Jay does his stuff and you hear all about it. We program our Sony DSC-S75 camera to take photos in a high-resolution mode, 2048x1536 pixels, or about 3 million pixels total for each photo. This compresses down to about 1.3 megabytes per photo in the JPG format that most websites use, far too large to expect our friends to download to their computers. So Jan uses Adobe Photoshop Elements, or Adobe Image Ready to reduce the size and resolution of the photos for quicker downloading. We've almost given up taking photos with regular film, because we can order (www.snapfish.com is our favorite source) as many high-quality prints as we want from our high-resolution digital files. Radio 'hams' are also known as amateur radio operators, but that sounds too stuffy. You have to pass a group of tests decreed by the Federal Communications Commission (or equivalent in other countries), concerning technical aspects of radio, regulations, safety, etc. To use the frequency bands that permit long-distance contacts, you also have to pass a simple test on receiving Morse Code at five words per minute (much easier than it sounds). In return, you have access to a global network of hams who are only too glad to help you in any way possible. They'll gladly help in emergencies, they pass messages to family, and they'll even set up a phone call for you via the radio link. It's a wonderful group of people and they make the cruising life much safer and more pleasant for the likes of us. Signe's has a General license and her call sign is W3IIJ (Whiskey Three India India Juliette) . That's the same call sign her father -- also a ham for many years before his death -- had, and she's very pleased to have been granted it. Jan has an Extra license, which allows him use of all the amateur bands, and his call sign is K7JT (Kilo Seven Juliette Tango). That's a 'vanity' call sign with his initials. 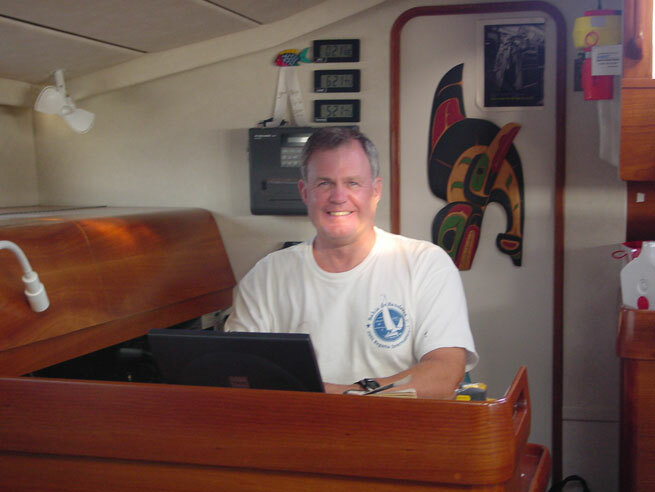 Email via ham radio is one of the best things that has happened to make cruising more enjoyable, because we can keep in touch with our families so much better. our most frequent and important use of email. Daily, when aboard Raven, we upload and download email messages via our laptop, the radio transceiver, and a special modem. In a cruising season, we'll easily send and receive over 500 emails. This Winlink2000 network is maintained by 25+ hams with stations in all continents, who dedicate their stations to helping nomads like us stay in touch. They even provide a host of internet weather reports from around the world. Cruisers stay in touch with each other via radio nets of several kinds. 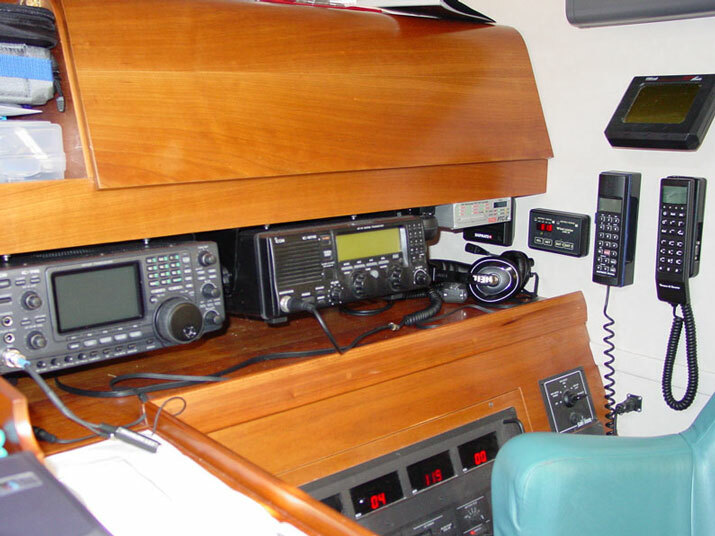 For example, all of the Mexican cruising ports have regular morning local VHF radio nets where all the cruisers trade information and help each other with problems. For longer distances, both ham and marine single sideband nets help us talk with our friends in other boats up to several thousand miles away. All of the many boats crossing the Pacific each year have at least eight formal nets to choose from, plus lots of informal ones among small groups of boats. Many hams in the US and New Zealand provide valuable tracking services so that families back home always know where we are and how we're doing. The most basic electronic instrument that every boat really must have is an acoustic depth sounder. This essential item not only warns you of shallow water, but in conjunction with the depths listed on the charts it's a great help in determining your position if other navigation gear breaks down. But all cruising boats with sane skippers have GPS receivers aboard, which these days give positions every few seconds, accurate to within a boat length! GPS positions are now so good that the charts aren't accurate enough. In Mexico and many of the Pacific islands, charts are often based on surveys done in sailing ships during the 19th century! Consequently, every cruiser in his right mind seasons his GPS positions with lots of salt. Almost everyone carries a sextant and the tables needed for celestial navigation, but we all hope we never have to use them. Another basic is radar. Raven has a powerful Furuno model 1942 Mark II radar, with a four-foot open-array antenna (that's the kind with a rotating bar up in the rigging), plus a backup Sitex RadarPC in a small radome. The Furuno has an amazing ability to pick out targets with great accuracy, and is a tremendous help in navigation and avoiding big ships. The Sitex RadarPC has no display unit. It uses the laptop screen as its display; great concept and it works well. 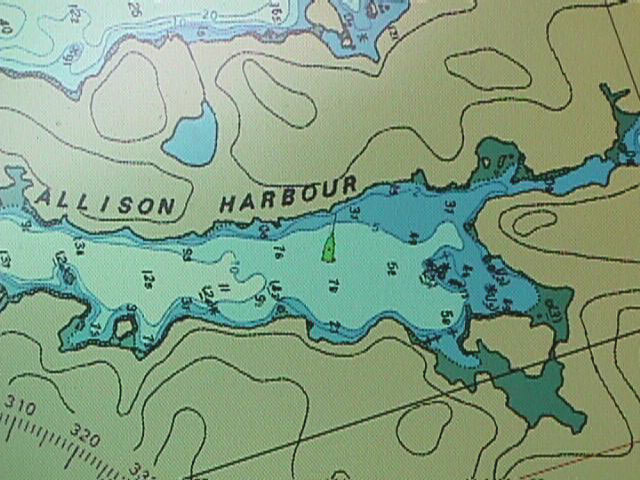 We can even display the Sitex radar image on top of an electronic chart. To help ships avoid us, we also have a transponder that amplifies our image on other radars' screens. 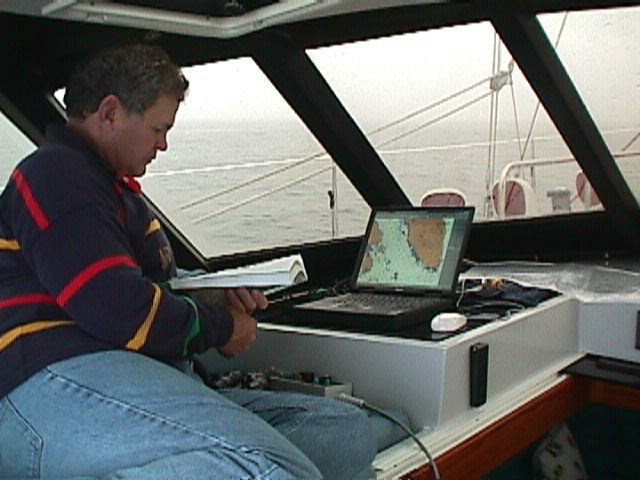 Like many boats, we have a laptop computer (our fifth Dell PC) aboard, along with charts on CD-ROM. We also carry the original paper charts, of course, for reasons that should be clear if your computer has ever suddenly given you the Blue Screen of Death. No way we'd trust our lives to a PC! 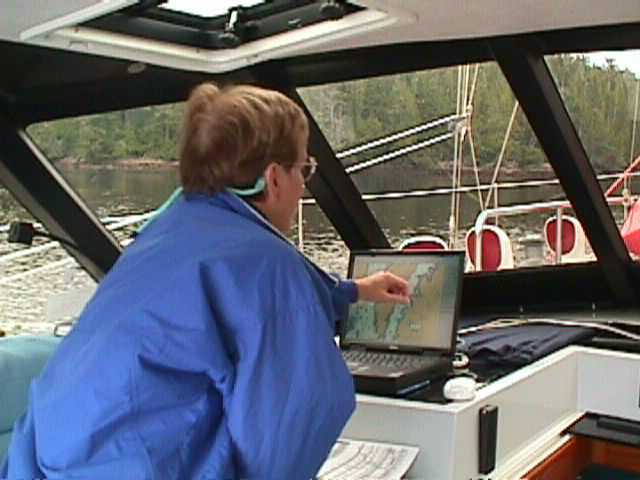 Still, having the charts on the PC screen, with the GPS position plotted electronically, has changed everyone's navigation habits. No, we have no interest in steering Raven by remote control via the internet, as some cynics have suggested is the next step. In fact, we don't even have an electronic link between our excellent autopilot and the computers. It's just not safe to have a computer guiding the boat through possibly dangerous waters. We insist on having a human brain -- one that's awake, with luck! -- constantly monitoring the weather, position, course, and speed. This page was last updated on 04/13/04.